Cons • Using domain blocking or traffic meter will reduce routing throughput below 500 Mbps. 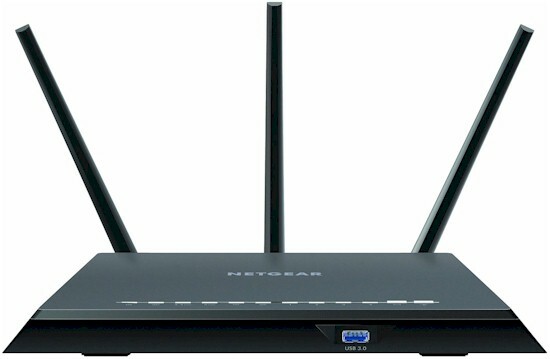 NETGEAR's original R7000 Nighthawk has stood the test of time, becoming one of the top-selling AC class routers. NETGEAR has wisely left the design alone, resisting the lure of a Rev A to shave a few pennies off manufacturing cost. But with the R7000P, the company is attempting to breathe a bit more life (and profit) from a 3x3 AC member of the Nighthawk family. The P is still a Broadcom-based design and retains Broadcom's venerable BCM4360 radio SoC for 2.4 GHz. But the 5 GHz radio is a BCM4365, which is a "Wave2" 802.11ac SoC that supports MU-MIMO. The BCM4365 also supports non-standard 1024 QAM that serves only to artifically inflate the class rating from AC1900 to AC2300. This breaks down as 600 Mbps in 2.4 GHz and 1625 Mbps in 5 GHz for a total of 2225 Mbps, which is rounded up to 2300. But since none of us own a device that supports 1024 QAM, the P is for all intents and purposes an AC1900 class router. Only owners of an ASUS PCE-AC88 PCIe desktop adapter will be able to take advantage of the R7000P's 1024 QAM link rate and only if the adapter is very close to the router. For most people, though, the P is for all intents and purposes an AC1900 class router. The R7000P's callouts are shown below. If it looks familiar, it's because the layout is virtually the same as the R7000's. The routers are so similar, I had to label them to not mix them up during testing. The R7000P's FCC inside photos are available, but the radio SoC images were not clear enough to see part numbers. So I had to open up my review sample after testing. The photo below shows the board removed from the case. The design borrows from the R7800's, with a large heatsink plate spanning most of the bottom cover. The processor RF can thermally couples to it via pads. The photo shows a very tidy design, with 2.4 GHz radio on the left and 5 GHz on the right. The 2.4 and 5 GHz front ends are interleaved and combined to feed three external dual-band dipole antennas via RP-SMA connectors. For reference, here's the R7000. The processor section sits on the other side of the board, with SoC, RAM and flash all inside one RF can. The USB 3.0 connector has a nice short connection path to the processor, with traces far away from the radios to minimize interference. The component summary table shows NETGEAR opted to use the slightly slower (800 MHz) BCM4708C0 vs. the 1 GHz BCM4709A used in the R7000. The component summary table shows NETGEAR opted to use the BCM4708C0 vs. the BCM4709A used in the R7000. The 4709 used to have a clock speed advantage (1 GHz vs. 800 MHz). But the BCM4708C0 is also clocked at 1 GHz. There must be some differences between the BCM4708 and 4709 (and BCM4707), but Broadcom's product page doesn't describe them. RAM and flash capacities remain the same. The use of 2.4 and 5 GHz front end devices vs. separate power amps, switches and mixers, reduces component count, cost and yields an obviously cleaner layout for the R7000P.